A crucial reference and guide for parents, written by a team of renowned experts. Caring for Kids is a comprehensive and up-to-date reference to health and wellness in children from birth to age ten. Written by a team of world famous physicians from Toronto's Hospital for Sick Children, this in-depth book cites medically sound advice backed up with cutting-edge research. The authors provide information on conditions that affect children by answering three basic questions: What is the condition? What can parents expect to happen? How should the problem be treated? Topics discussed include: Common symptoms Childhood infections Growth and nutrition Allergic disorders Sleep and behavior problems Genetic and metabolic diseases Blood diseases and immune disorders Neurological and muscle problems Eye problems, ear, nose, and throat problems Heart and circulatory problems Gastrointestinal problems Skin conditions Accidents and emergencies. 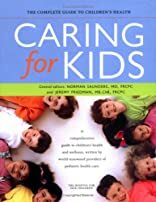 Caring for Kids is written in a thoughtful, compassionate, and straightforward style, and will become the indispensable reference for every parent and caregiver. About Jeremy Friedman (Editor) : Jeremy Friedman is a published author and an editor. Published credits of Jeremy Friedman include Complete Guide to Children's Health and Caring for Kids: The Complete Guide to Children's Health. About Norman Saunders (Editor) : Norman Saunders is a published editor. A published credit of Norman Saunders is Caring for Kids: The Complete Guide to Children's Health.